Safesurfs.net is a potentially harmful search website that can end up in your browsers without your knowledge after you run a malicious downloader. We have found that this infection is indeed a browser hijacker that modifies the Target lines of your browser shortcuts in order to appear as your home page every time you launch your browsers. The problem with this search page is that it may introduce you to unreliable third-party content and through those you may let more infections onto your computer or get scammed by criminals. A lot of users may consider such a search engine innocent by the look, but you need to understand the risks you take if you keep this infection on board. We suggest that you remove Safesurfs.net as soon as possible. For the details, please carry on reading our article. The most likely way for you to have this annoying browser hijacker on your computer is that you downloaded and ran a bad downloader. This can happen when you click on fake software update pop-ups or any other unsafe third-party ads that promote malicious bundles. It is possible that your computer is infected with adware programs or browser hijackers and this is why you can be exposed to such content. Another reason can be that you land on a suspicious website, including freeware, torrent, and gaming sites. You may want to download a free file (music or movie) or a free program and you run a web search to find a place for download. This is a very common way to be introduced to unfamiliar and fake file-sharing websites. Most users would not even think that reputable search engines, such as Google and Yahoo, can actually present them with such links. Contrary to popular belief, though, it is totally possible and this is how you can infect your system. Landing on an unfamiliar site can trick you easily. These pages are usually full of unsafe third-party advertisements, which are quite often disguised. They may seem like they are part of the page, for example. So when you click on a download button or link, you may not even drop your targeted program onto your system, but, instead, a whole bundle of malware threats. If this could be your case, too, we suggest that you scan your system with a malware scanner to identify all threats after you delete Safesurfs.net. 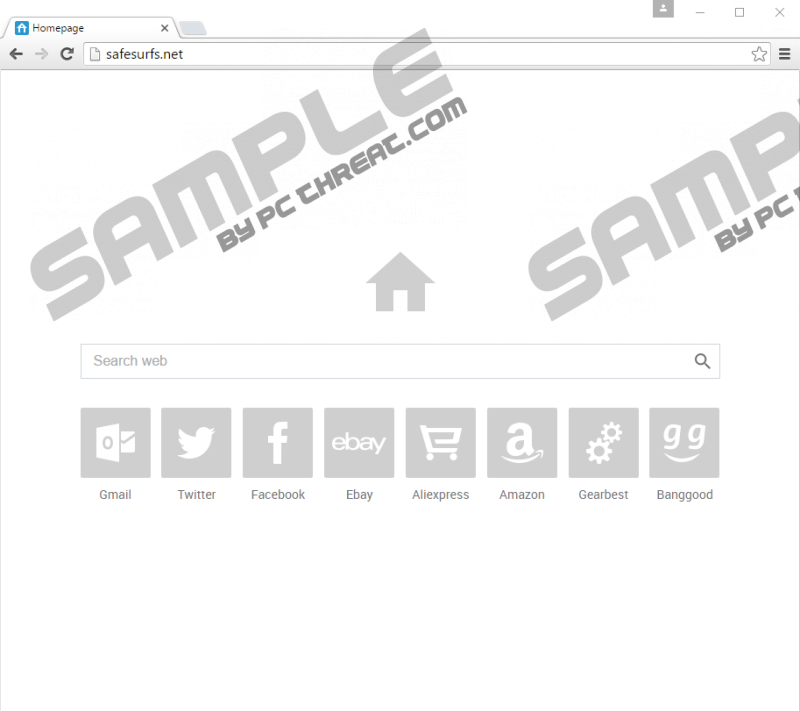 We have found that this browser hijacker is an identical clone of Safesurfs.com and they both are hosted on the same server (50.115.127.222 IP) with foryourweb.net, your-home-page.net, and safebrowsing.biz. This malware infection seems to be most popular in these countries: India, Pakistan, and Indonesia. Basically, this hijacker adds its URL to the Target lines of your browser shortcuts and this is how it makes sure that you cannot remove it easily by changing your browser settings. At first sight this search website looks completely normal and legitimate. There is a big search box in the middle of the page and a number of quick-link thumbnails below it. These buttons link to popular websites, such as Gmail, Twitter, Facebook, Ebay, and so on. Some of these may be safe to click on; however, we have found that one particular button that leads to Gearbest first loads ad.admitad.com/g/2316b8f856074e21213b22af2ed61b/?subid=1 page and then instantly redirects to gearbest.com/?admitad_uid=857ee478f48ce987d6ea9a28fc4c9800. This could mean that this infection injects certain third-party ads into this page, which definitely could make it risky to click on any content there. However, the major issue is presented by the search engine itself. This browser hijacker can collect information about your online activities and use this to introduce you to customized content through the search results. Unfortunately, cyber criminals can misuse this information in an attempt to lure you onto their fake websites to scam you. This search page redirects your queries to a modified Yahoo search results page, which could be filled with potentially unreliable third-party ads and links. Clicking on such content could take you to malicious websites and you could be tricked into revealing personally identifiable information as well as your credit card details. If you do not wish to lose money from your accounts or end up with more infections, you should delete Safesurfs.net right away. We have found that this browser hijacker does not require the removal of extensions from your browsers as it only uses the Target line trick to become your home page. If you are unfamiliar with the steps of Target line restoration, please follow our instructions below. It should be a priority to protect your virtual world if you are a security-minded user. You can do a lot for the protection of your system and your files if you only use reputable and official websites for downloading software, and if you do not engage with suspicious third-party content. However, the best way for you to safeguard your computer is to use a professional anti-malware program. Right-click on your browser shortcut on your desktop. Select Properties and click on the General Tab. Make sure that the Read-only box is unchecked. Choose the Shortcut tab and restore the Target line to point to your browser only. Right-click on the shortcut on your Taskbar. Right-click on the browser name option at the bottom. Repeat steps 1 to 7 to restore all the Target lines. Quick & tested solution for Safesurfs.net removal.